Two or three times a week here at Lensrentals.com, we get one of two common support calls. Scenario number one is that someone thought they transferred all of their footage over, but later found that they missed a couple of clips and need us to send them their rental cards back. If we haven’t inspected those cards yet, we’re happy to do that, but if our techs have already inspected them, that’s a problem we can’t solve. We perform a full and secure format at inspection to make sure previous customers’ footage isn’t recoverable on subsequent rentals. Once the footage is gone, the footage is really and truly gone. No amount of file recovery software can bring it back. That’s never a fun phone to call to have. The second scenario is that someone did manage to transfer over all of their footage, but one of the clips was corrupted in the transfer. Typically this realization comes during the edit, after we’ve already formatted the original media. That’s an equally tough phone call. True, sometimes file corruption happens in-camera, but nine times out of ten, the file was corrupted during the transfer from the card to the computer or hard drive. These kinds of problems aren’t something you can avoid entirely. There are inherent risks in working with digital media just like there are inherent risks in working with tape or film. However, there are steps you can take to mitigate that risk and to ensure that, if a problem arises, you’re prepared to work around it. The first thing to do is start with reliable media in the first place by only purchasing cards from established companies like Sandisk or Lexar. They might be a little more expensive, but they’re absolutely worth the investment. The few bucks you save by settling on that Walgreens Discount House Brand 4GB 10mbps SD card is going to seem a lot less significant when it crashes on you during a job. Buy (or, hey, rent) high-quality media and you’ll be set up for success from the start. Next, you’ll want to format all of your cards in-camera, ideally well before your shoot begins. Do this every time, whether the camera prompts you to or not, whether the cards are used or not, and whether you think you already did it or not. 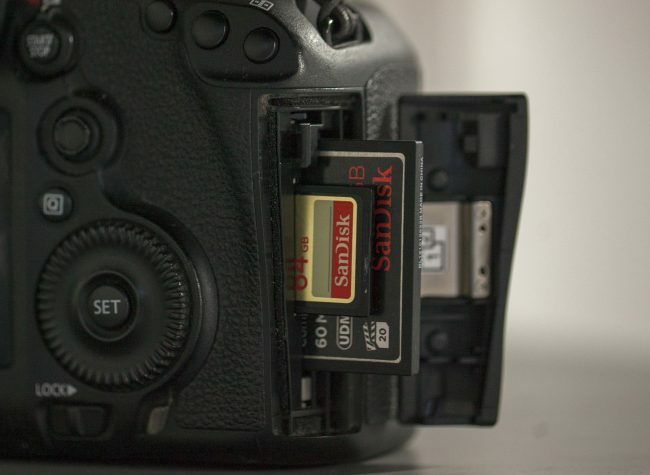 If the camera gives you the option to do a complete or secure format, take that option. Take the time to make sure that the cards are prepped for the camera they’re going to be working in so you don’t have to take that time during your shoot. On shoot days, the less you have to think about the better. Take note, too, about whether you need to unmount or “eject” the media from the camera before physically removing it, as you do with a RED or an Odyssey 7Q. If so, make sure anyone handling the media knows to wait until it’s ejected before taking it out or turning the camera off. In our experience, most preventable card corruption happens because someone turned off the camera before the media was unmounted. If your camera is capable of dual-recording the same data to two different card slots, I cannot more highly recommend taking advantage of that feature. Doubling your media costs can be a hard sell, I know. But all that money spent on lights, cameras, actors, and bad pizza means nothing if you lose everything you shot. You should also do everything you can to stay as organized as possible. Keep spent cards separate from empty cards, stick to a consistent file structure and naming convention on your backup drives, keep careful shot notes, etc. You’ll also have to decide whose job it is to keep track of footage on set. 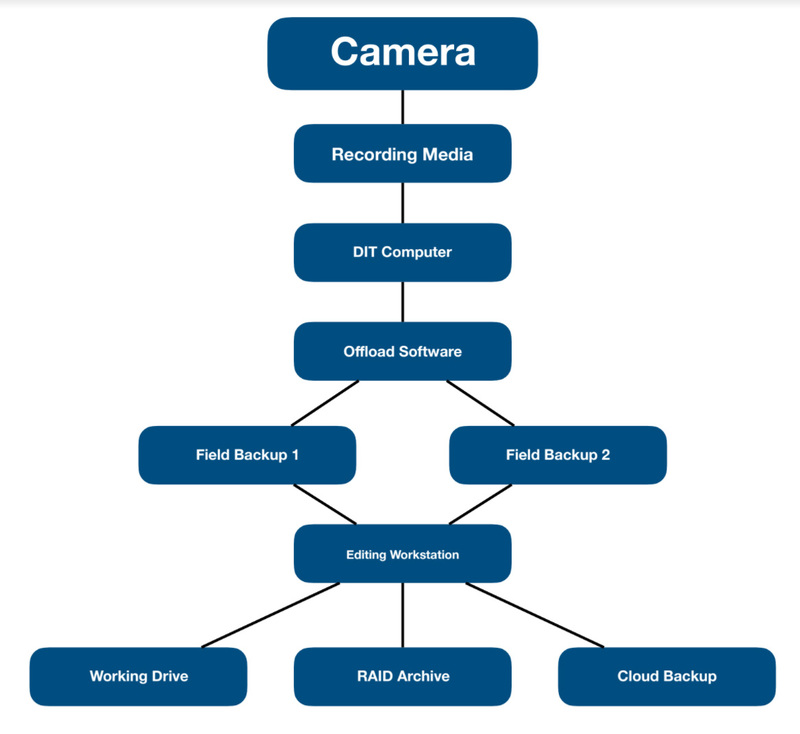 Ideally, all on-set media transfer, backup, and metadata logging would be the job of one person. While I realize not every budget allows for a DIT (Digital Imaging Technician), I’d highly recommend at least considering that position on every shoot. Having someone on set whose sole responsibility is to safely back up and organize footage keeps the rest of the crew moving and helps prevent mistakes caused by distraction. When they’re not transferring footage, DITs can also log metadata, color correct dailies, and even help with exposure if needed. Even if you can’t afford a DIT specifically, it’s helpful to have the jobs a DIT would typically handle assigned to someone who can focus purely on those duties. You don’t want your camera operator in charge of backing up footage if you can avoid it. There are a few different options when it comes to offloading software, all at different price points and with slightly different features. At the highest end, you’ll see full-time professional DITs using an application called Silverstack, which offers professional features such as advanced color grading, LTO tape support, and basic editing tools for creating dailies. At $600 per year, it’s the most expensive piece of software for doing this kind of work and is probably overkill for most people who aren’t professional DITs. For anyone reading this article, I’d recommend instead looking at an application called Shotput Pro. It’s $129 for a permanent license and includes all the features you’d need if you’re not worried about in-app color correction or editing. Shotput Pro will simultaneously transfer to multiple locations, generate PDF reports, and, most importantly, verify all transfers. If you’re looking for something even less expensive, or don’t like the UI of Shotput Pro, take a look at Offload or Hedge (which, full disclosure, I use personally). They’re $99 each, have simple interfaces and include all of the basic features needed in an offload application. 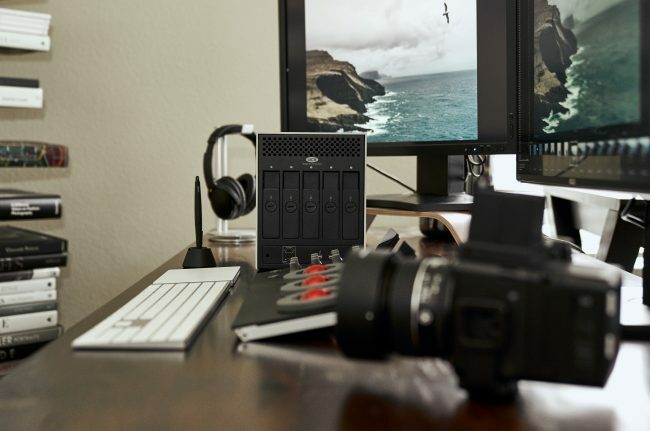 After your shoot is over and you’ve safely transferred all of your files to external drives, it’s time to consider how you’ll store your media in the long term. Different individuals and businesses will all approach storage in different ways because of their varying needs, workflows, and resources. There’s no one correct answer for everyone. However, there are a few rules of thumb. As an example, I’ll lay out my personal post workflow. Keep in mind that I’m doing almost all of my editing work as a one-man band. I’m also working in many different mediums, so nothing I’m going to go over here is video-specific. All of my still photography, audio, and graphics projects are organized the same way. I won’t go into too much detail about my file structure except to say that, in the root directory of my archive and working drives, everything goes into a folder with a job number. Sub-folders then organize all the data into categories. To keep track of which jobs are which, I maintain a Google spreadsheet that fills in job numbers with descriptions and, if applicable, client information. My archive system is relatively simple. I’ve got a 4-drive RAID array in my office that gets updated every time I work on a project. The array is set to RAID 1+0, which means I could lose two of the drives and still be able to recover my data. Usually, I’ll put a 1TB drive in each bay, fill them as I go, and then replace them all once I run out of room to start new projects. Once they’re full, they get labeled with the job numbers they contain and stored in plastic cases on a bookshelf. It’s not a perfect system, but it works for me, and it’s adaptable to many different project types. In case I get robbed, or my house burns down, I also keep an online backup of the entire RAID archive. Cloud storage through Amazon or Google is still relatively inexpensive, even for multiple terabytes of information, so adding that second level of safety to a system like this is a no-brainer. Finally, I keep a two-bay Thunderbolt hard drive dock on my desk as a working drive. Solid state media and a Thunderbolt connection give me the speed and reliability I need in a drive that I’m going to be editing and rendering from. For now, there’s a single 960gb solid state drive in the first bay. If I ever exceed those storage needs on a single project, I’ll have room to expand into the second bay. I start work by transferring the job file from my archive to the working drive, do whatever needs doing, then replace the old job folder on the archive with the new one at the end of the day. If the SSD ever dies on me, I’ve lost at most one day’s work. For a video project or anything with a ton of media, I’ll often keep copies of all my source files on both the archive drive and the working drive and just replace the Premiere (or whatever) project file as I go. Again, this isn’t a system I’d recommend for everyone. I think it’s a good place to start, but you’ll always need to adapt any workflow to fit your own needs. The important point here is that these sorts of strategies are things you should be thinking about at every step of your production. How does your camera or codec choice affect your media needs? How are you going to ensure safe data backup in the field? How are you going to work with all of this footage in post in a way that’s both secure and efficient? Answering all of these questions ahead of time will keep your media safe and your clients happy. 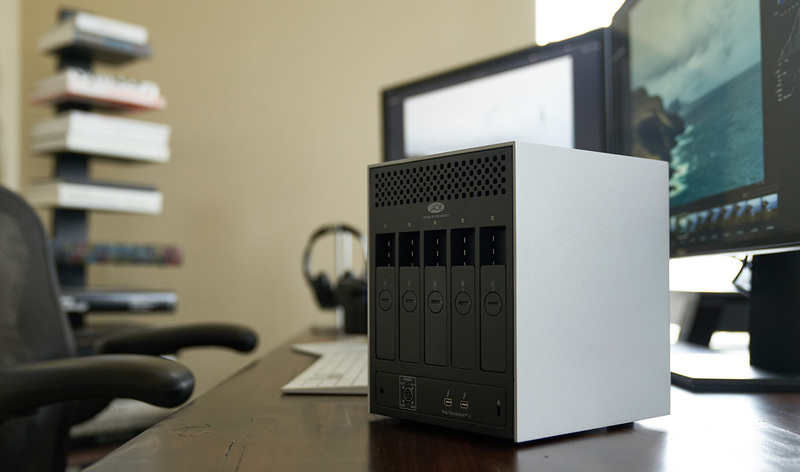 Special thanks to Faran Najafi for images of his cleaner desk and RAID system. Backblaze.com is a great affordable option for cloud backup. You can back up as much data (and harrdrives) as is attached to one workstation that you have. I personally have backed up like 8 TB worth of data through this service. It’s only $50 per year (per workstation you have backed up). You can restore per file through their web interface, or if for some reason you lose all data locally, you can get them to ship you a harddrive with all of your data on it for essentially the cost of a harddrive. Firstly if statistics say anything it’s that “statistically its certain there will be an error and rebuild will fail” isn’t correct. There is always a chance stuff will work. Real-World testing founds about four non-recoverable errors per two petabytes read, plus data-scrubbing really helps discovering and fixing problems that might break rebuilds. Mathematically and based on statistical risk of unrecoverable error while rebuilding an array, RAID5 is fine to around 12TB (eg. 5x2TB, 4x3TB) arrays. Above that you are pushing the statistical probability of an error while rebuilding above 1 (statistically its certain there will be an error and rebuild will fail). Of course many people have rebuilt 12TB and bigger RAID5 arrays without errors, and some people find RAID6 / RAIDZ2 of that size die during rebuild – we’re just looking at statistics. To the above… RAID10 (1+0) is a special use case RAID where you need the speed offered by RAID0 (striped without parity) but also the redundancy of RAID1. Film editing would be a case for using RAID10 (if using 15k SAS drives vs 7200k SATA). In any case (not that anyone in this part of the thread was suggesting it) having a RAID system is never a substitute to having a backup. One thing I’d add – be careful with backup software which synchronises the backups to the main data. when you accidentally delete something off your main data and don’t notice, the next time you synchronise your backup also deletes it :-(. And buy from a reputable supplier so you’re not getting Walgreens Discount House Brand cards high have been made to look like Sandisk or Lexar. Using FTP, Email or cloud methods for file transfer is just too slow. Binfer is a superb file transfer software, without all the headaches of FTP and nuances of torrents. Is Lexar still a good option? They basically closed and the name got sold. I had 2 of their lemon card readers die on me and a one of their cards, I’ve never had a problem with Sandisk. I always back up on a hard drive which they goes to my neighbour, at which point it is swopped for a second hard drive which is used for the next back up. When that one is used it is taken around and swopped back. The reason for keeping one at another location means if there is a house fire or some bad thing happens at home, there is always a safe backup elsewhere. No matter what your raid configuration, you should always have an automated backup. Never trust a single drive, a single raid, or even yourself to make a copy. I think in an ideal world you should have a local primary and backup so that you can switch over to the backup in case the primary goes down and then an offsite backup if something happens to your location, like a flood. Had to replace 2 drive this year that failed. Thank god for RAID. ZFS Snapshots saves you from accidental deletes and ransomwares. And the firmware is opensource FreeBSD. I have my RAID-5 scrub its array once a week and have yet to find a silent error, so I suspect non-datacentre users are okay with RAID-5 and a backup. (No-one with a RAID system is okay without a backup, as one accidental delete and you’re screwed. Let alone some ransomware.) Having 2 redundant drives and no backup is a bad idea and with a backup I think one redundant drive should be okay for 4-5 drive boxes (although someone’s probably got bitten at some point in history). I think the bigger worries are in the firmware the box supplier hands you, so going for a configuration that is very widely used is IMHO a big plus as errors are more likely to be spotted quickly. Better to use RaidZ2 or RaidZ3 using ZFS. Normal Raid using more than 500 GB drives is dangerous. There’s RAID 01 (or 0+1) where you have a 2-disk striped volume and you then have a mirror copy of that. You can lose both drives from one mirror and still have your data. So drives A+B are your data and striped (alternate chunks are on each drive, so can access the data at 2x-ish the speed by getting half from each drive in parallel). You have B+C which are a mirror of A+B. You can lose A and B or C and D but not A+C or B+D. In RAID 10 (aka 1+0) you have two mirror pairs and the data is striped between them. Here you can lose the first drive of one pair and the second of the other and still have your data. So drives A+B and C+D are two mirrored pairs. Half the data is on A+B and the other half on C+D (striped between the pairs). You can lose A+D or B+C and still have your data. That is correct. RAID10 creates a logical volume and stripes (RAID0) it across two disks and then mirrors (RAID1) that striped volume across another two disks, which occurs invisibly to the user. In this configuration you can lose one disk in either volume, but not both, or lose two disks in any single volume. Said another way – if you have disks A, B, C, and D where A&B are one striped set and C&D are the other you can lose any single drive or A and B together or C and D together. But you will lose everything if A and C fails or C and D fail. So it’s not a full 2 disk redundancy. Of you want full 2 disk redundancy you should use RAID6, which breaks the data into blocks, creates parity blocks for sets of blocks, and distributes them across the drives – you can have any two drives fail simultaneously without issue. It’s clever and pretty nice. I use RAID5 (single disk redundancy) and have lost a disk. I just popped a new one in the NAS, and it rebuilt the volume no problem – no data lost. I think in RAID10 (aka 1+0) you can’t lose any two drives, they’d need to be the right two (i.e. one per mirror, as it’s two 2-drive mirrors which are then striped, so each mirror pair has every other piece of data, lose the two drives in a mirror and you’re screwed). In RAID6 you can lose any two, plus get the same capacity as RAID10, but with less performance. I have cloud backup of 90% of the files. I also have a second location Hard Drive Backup with master files and final projects. My computer has 2 mirrored work drives in case of failure and I backup locally on a Synology 5 bay 24TB drive with 2 disk fault tolerance. I never format an SD card unless it has been backed up in all of the above. You can never be too careful and you can still loose data. Think of the worst case scenario and double up on contingencies, you will sleep better at night.